Preamble: Conditions relating to the promotional offer of 2 pairs for €330 (taxes included) valid from 21t February 2017 to 27th June 2017. This offer is valid when you buy 2 pairs at once and applies for all shoes up to €220, whatever the range. For shoes costing more than €220 a 15% discount applies. If you buy one pair for €220 and another for €139, you will pay €330. If you buy a 3rd pair (up to €220) = you would pay it €165. If you buy a 3rd pair which costs more than €220 a 15% discount applies. 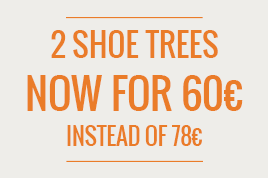 Note: a €15 surcharge will also apply to extra-large shoes. The refund of a pair of shoes subject to one of these promotional offers will lead to the cancellation of that offer, meaning you will be charged the full price for the remaining pair. The offer will only be valid if you buy two pairs of shoes. The current document (General Sales Conditions) defines the conditions which apply to sales realised between all natural persons who are non-commercial entities making a purchase on the website www.finsbury.fr, hereinafter referred to as "the customer", and the registered company AB Trading, hereinafter referred to as "Finsbury" (hereinafter both will be referred to together as the "Parties"). The current General Sales Conditions regulate the relationship between the Parties and may be subject to periodic modifications. Any modified version of The General Sales Conditions will be applicable as soon as this version is published online. These General Sales Conditions take precedence over all other conditions, such as those in effect in stores. Orders must be paid for in full with a single payment. The order amount cannot exceed €999. The customer receives an email from Finsbury confirming the order. An invoice is available for the customer to download and print in the customer portal, once the order has been confirmed. Finsbury recommends that customers keep their email confirmation. The customer can see the details of his/her order and its total price throughout the different stages of the order process and has the chance to correct any errors before confirming the order at the payment validation stage. When the customer confirms an order this implies the acceptance by the customer of the price, product descriptions and General Sales Conditions. Finsbury reserves the right to cancel or refuse to accept any order from a customer with whom a dispute exists regarding a previous order. The execution of an order on the site requires a customer account to be opened, which stores administrative information relative to the customer as well as the delivery details. The customer account also enables the customer to access his/her order history as well as copies of any invoices during the legal retention period. Finsbury's offers and products are available for as long as they are displayed on the website, assuming stock remains. In the case that a product is unavailable after the customer's order has been executed, the customer will be informed by email. The order will automatically be cancelled and the customer will receive an immediate refund if the payment has already been sent from the customer's bank account, as stipulated in Article 7 of the General Sales Conditions. The prices of products are stated in euros (including taxes) before delivery costs are taken into account. Delivery costs are specified on your order form before order confirmation. Finsbury may alter at any time and without forewarning the prices of products sold on the website. The price charged will be the price in effect at the moment the order is confirmed. In the case of card payment, the customer's account will be debited one day after the order is made. In the event of a payment being declined, Finsbury cannot be held responsible. The order will be dispatched after the customer's bank details have been verified and authorisation has been granted for Finsbury to debit the customer's bank account. If authorisation to debit the customer's account is not obtained, the transaction will not go ahead. Finsbury aims to deliver all products within 6 days, beginning the day after the customer's order confirmation. Orders made on the website on Friday afternoon, Saturday or Sunday won't be processed until the following Monday. Orders made on the website on a public holiday which isn't Friday, Saturday or Sunday will likewise be processed on the next business day. The maximum delivery time is 30 days. It is the customer's responsibility to verify the condition of any products when they are delivered. Delivery costs depend on the address, the delivery method selected and the size of the order. The costs of the customer's chosen delivery method are displayed on the website during the order process as part of an order summary with details of the products in the customer's basket. Orders will be sent to the address specified by the customer in Metropolitan France, Corsica or Monaco, excluding French overseas territories, and will not be sent to any address outside these geographic areas. The customer may track his/her order on the websites of Colissimo or Chronopost depending on the delivery method chosen. In case of a delivery delay of more than 7 days after the date indicated on the customer's order, and if this delay isn't due to a case of Force Majeure, the customer may cancel his/her order. This action must be carried out within 60 business days, in accordance with legal provisions. The customer must send a letter with return receipt requested addressed to "Service Client Internet" to ask for a cancellation. The letter must be accompanied by a copy of the email with the order confirmation details. If the customer receives the product after the order has been cancelled, Finsbury will refund the customer and pay for the cost of returning the product once this has been received in its original state by Finsbury,as stipulated in Article 8. In accordance with legal provisions, the customer has the right to retract his/her order without justification and without incurring any costs, apart from the cost of returning the product. This right doesn't apply for orders of customised products. The right of retraction must be exercised within 14 days after the product has been received. The customer will receive a full refund as soon as possible and at the latest 15 working days after he/she has exercised the right of retraction. The refund may nevertheless be delayed beyond the 15-day period until the product returned by the customer has been received and verified. The customer can also exchange the product ordered in the case of it being the wrong size. The customer has 14 days after the product has been received to return it and exchange it for another one. Under all circumstances, returned products must be new, have not been used and be in their original packaging and in perfect condition. Go to our website www.finsbury-shoes.com under "My account". Click the "My Orders" tab. Click on your order number (series of letters) in the column "order reference", you will find here all the details of your order. Scroll down the page and go to the Return Merchandise area. Tick the product(s) to be returned, indicate if you would like a refund or an exchange and click "create a return"
Your return voucher has been generated. To print it, go to the "My Returns" tab and download the return label (pdf format). Make sure to insert this label into your return package and send it to the address appearing on the printed label. Once your return is handled by our logistics team, we will notify you by e-mail. Any product which has been used or damaged, isn't accompanied by a return voucher or has an address other than the one indicated will not be accepted by Finsbury. The product will in this case be returned to the customer and he/she will be unable to request a refund or exchange. The return of a product should be made using Colissimo recorded delivery. Be sure to obtain proof of delivery. The sender is responsible for the package. FINSBURY will not be held responsible under any circumstances if the product is lost or stolen while in transit. Finsbury remains the sole owner of any product purchased by the customer until the latter has fulfilled all his/her obligations, in particular regarding the payment in full of this product. Product refunds, as set out in Articles 7 and 8, will be carried out as soon as possible and at the latest 15 days after the right has been exercised. The refund may nevertheless be delayed beyond the 15-day period until the product returned by the customer has been received and verified. Refunds cover the price of the product and delivery costs but do not include the cost of returning the product. The refund will be carried out using the same payment method employed by the customer initially, unless either the customer and Finsbury expressly agree otherwise. Credit notes are valid for a maximum of 6 months after their issue date. Information relative to the customer's order is subject to an automatic treatment of data by ELYSNET HSBC. This automatic treatment of data aims to fight against bank card fraud and provide an analysis of transactions which take place. ELYSNET HSCB and Finsbury are the recipients of the data relative to the customer's order. If data relative to the customer's order is not transmitted this stops the order from being carried out and means the customer's transaction cannot be analysed. In the event of payments not being made due to the fraudulent use of a debit/credit card, this will lead the ELYSNET HSBC to open a payment incident file with the personal contact details and order of the customer in question. Any incorrect declaration or anomaly may also be subject to special treatment. Finsbury guarantees the retention of order forms and invoices constituting faithful copies of the original documents in a safe place in accordance with the legal provisions of the law of the 13th March 2000 and article 1348 of the Civil Code. Finsbury guarantees the retention of these documents for 10 years and will ensure clients are able to access them if they request to do so. Unless evidence to the contrary is shown, the data recorded by Finsbury and the customer's order confirmation constitute proof of the aforementioned order, in accordance with the legal provisions of the law of the 13th March 2000, and stipulate the payment of the total amount in question for the purchase of the products on the order form. This validation is equivalent to a signature and express acceptance. Finsbury will not be held responsible if the contract entered into is not fulfilled, either due to a case of Force Majeure or the actions of the customer, or due to any unpredictable and insurmountable harm caused as a result of the use of the Internet, such as service disruption, an external intrusion or the presence of computer viruses. The photographs and descriptive illustrations of products displayed on the website are not contractually binding and hence Finsbury will not be held responsible for any action taken on the basis of these. The products offered by Finsbury are subject to the legal warranty set out in the article 1641 and the following articles of the Civil Code. Notwithstanding, after two years from the purchase date Finsbury will no longer be held responsible for any product defects. Finsbury does its utmost to provide clients with products which conform to the provisions L211-4 and L211-5 of the Consumer Protection Code. However, Finsbury cannot completely rule out any delivery which does not conform to these standards. After this period, if the aforementioned formality is not respected the product will be deemed acceptable and undamaged, and Finsbury will not accept any complaints regarding the product. If the product defect is confirmed, Finsbury will aim to replace the product free of charge or offer the customer a refund as soon as possible, as stipulated in Article 7. In the case of products returned in poor condition, Finsbury reserves the right to refuse to let the same customer make an order in the future. The provisions of this article do not infringe the customer's right to retract his/her order, as stipulated in Article 6. The collection and treatment of personal information aims to manage the relationship between Finsbury and the customer. This information may be sent to organisations with contractual links with Finsbury in order to carry out and manage orders and payments. In accordance with the provisions of the law no. 78-17 of the 6th January 1978 relative to information technology, computer files and freedoms, the customer has the right to access, alter or oppose the use of his/her personal details for a legitimate reason. Specific data treatment, linked to the analysis of transactions and the combating of fraud, may be carried out as stipulated in Article 11. The customer can at any point deactivate cookies by selecting the appropriate options on his/her web browser. However. deactivating cookies will limit site functionality. During the creation of the online account and later while managing preferences via the "My Account" portal, the customer can choose whether to receive offers from Finsbury's partners. It is also possible to stop subscribing in this case. For queries, the Finsbury Customer Services team can be contacted by filling out the online form Monday to Friday from 9:00am to 18:00pm. The General Sales Conditions are subject to French law. The language of the contract is French. In case of legal disputes, the French courts have sole jurisdiction. The website abides by French law and Finsbury does not guarantee under any circumstances that the website abides by the legislation which applies in the customer's country, in the case that the customer accesses the website from outside France.